Where the personal touch means so much. Celebrating the life of Lloyd Mack, Jr.
Be the first to share your favorite memory, photo or story of Lloyd. This memorial page is dedicated for family, friends and future generations to celebrate the life of their loved one. Obituary for Lloyd Mack, Jr.
Lloyd Mack, Jr. was born on December 6th, 1944 in Selma, Alabama to Lloyd and Marie Mack. He passed away on January 28, 2019 in Pensacola, Florida at 74 years of age after battling many health challenges. Lloyd was a distinguished Air Force Vietnam Veteran and skilled Machinist for the Federal Government. He was continually recognized and promoted for his diligent work ethic and leadership capabilities. In 1988, he was recognized by the White House and President Ronald Reagan for his exemplary service and outstanding accomplishments. He retired in 2004, where he was able to dedicate his time and love to his family. Before he retired, he lived an active lifestyle as a skilled bowler and played in a competitive softball league. Lloyd is preceded in death by his parents Lloyd Mack, Sr. and Marie Smith Mack of Selma, Alabama. He is survived by his brothers, Joseph Mack, Sr. and Willie E. Mack, Sr. of Selma, Alabama, and a host of other relatives and friends. 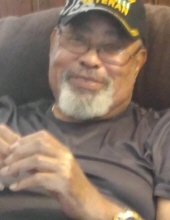 He was a warm and devoted husband to his beautiful wife Julia, and supportive father to his children Lloyd Bradford (Carletta) Mack of Atsugi, Japan, Brigida (Kenneth) Fisher of Pensacola, Florida, and Brandon Mack of Pensacola, Florida. His legacy continues through his grandchildren, Alexis (Parfait) Nseya, Jaylon Tellis, Solace Mack, Jaidyn Mack, Bryce Mack, Jacorey Mack, and Braden-Stone Mack. His memory will be cherished and kept alive by those he was surrounded by. He will always be remembered for his dependability and ability to selflessly provide for those he loved. He supported his children through their every need, and financially supported his grandchildren’s educational endeavors. He will also be remembered for his sacrificial love, contagious humor, his ability to fix anything, and is love for a good Whataburger and Coca-Cola. Funeral services will be held Friday, February 8, 2019, 11:30AM, at Faith Chapel Funeral Home North, 1000 S. Hwy 29, Cantonment, FL 32533. Visitation will be from 10:30 – 11:30AM prior to the funeral. Interment will be at Barrancas National Cemetery. In lieu of flowers the family requests donations be made to the American Heart Association or the American Kidney Fund. To send flowers or a remembrance gift to the family of Lloyd Mack, Jr., please visit our Tribute Store. "Email Address" would like to share the life celebration of Lloyd Mack, Jr.. Click on the "link" to go to share a favorite memory or leave a condolence message for the family.